Time 4 Thai is a stylish, contemporary Thai restaurant ideally situated close to George Street and a very short walk from Princes Street. Since opening its doors to customers in 2005, Time 4 Thai has successfully established itself as a firm favourite on the Thai dining scene for both residents and tourists alike. Walking into the restaurant will be an immediate pleasure. The interior is a blend of creams, lilacs and greens. The real scene stealer, however, is the large glass wall at the entrance, tastefully lit to enhance the lilac orchids embedded within. All of the crockery and cutlery is made and imported from Thailand giving an air of class and authenticity. 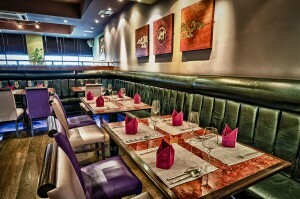 The menu can be described as modern Thai with king prawns and seafood as a speciality. Fresh ingredients are flown in from Thailand every week to ensure all dishes are cooked in authentic Thai flavours. Time 4 Thai has a very metropolitan feel to it being elegant and contemporary. Whereas Time 4 Thai’s sister restaurant, Thai Lemongrass, tends to be more of a homely local eatery, Time 4 Thai is definitely a big city venue.The 3-course set lunch at just £15.95 which will not be disappointed. Also proving very popular is the special lunch menu the restaurant has recently launched. All the dishes are a meal in itself, reasonably priced and are perfect for customers who don’t have much time on their hand but would still like to enjoy delicious and freshly prepared authentic Thai food. The main level of the restaurant is well-decorated and cleverly designed into four dining areas, giving a sense of intimacy without feeling confined. 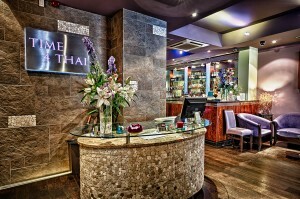 Overall, Time 4 Thai is aiming to bring authentic Thai cuisine and genuine Thai hospitality to the UK.